It’s the holiday season and our new Tagging is about travel destinations. Our goal was to find out if the Facebook Community prefers certain vacation spots to others. We placed all posts of TripAdvisor from November 2017 until July 2018 into the categories “city” and “landscape” to figure which one got interacted with more. The result is quite interesting. The category “landscapes” includes posts with pictures and videos of beaches, forests, deserts, islands and all other idylls one yearns for when everyday life gets stressful. Maybe that’s exactly the reason why TripAdvisor puts so much emphasis on this kind of posts. 231 posts got tagged “landscape”. That is almost double the amount of city posts (126). Posts that show urban skylines or the beautiful streets and canals of famous cities are way ahead when it comes to both likes and comments. 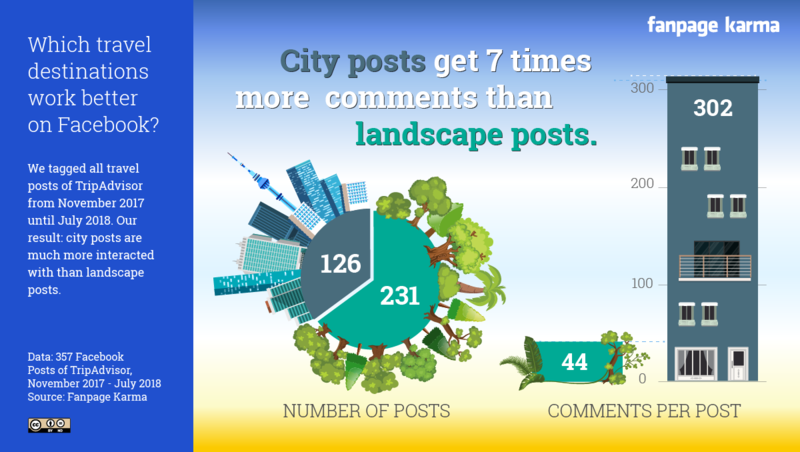 City posts got around 2200 likes on average, where landscapes made only half. But it is even more obvious when you look at the comments: cities got commented 302 times per post on average, landscapes only 45 times. So the surprising conclusion is that city posts are way better to motivate TripAdvisor’s Facebook Community to interact. This could be a good opportunity for the page to improve its engagement even more. The Tagging is available in the business version of Fanpage Karma Analytics. Visit www.fanpagekarma.com for a free two-weeks-trial.